I’ve been involved in pastoral ministry for over 25 years now and I’ve come to know these three things. The Christian life is messy. Following God is hard and we demand more from our role models than they could ever offer. Many books, Bible studies and Christian novels provide inspiring examples of faith, clear cut directives for us and happy endings. 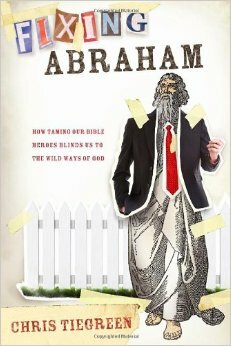 Chris Tiegreen does quite the opposite in Fixing Abraham. He points out the frailty, weakness and mistakes in our Bible heroes. His intention is not to destroy them, so don’t be alarmed (or overjoyed, depending on your perspective). The author’s writing style is fresh and funny, although I sometimes found his use of a short play at the beginning of chapters a bit distracting. I didn’t see the need for this, when the Biblical example was fairly straightforward. There were a couple theological objections I had as well. One being that Tiegreen suggests Jesus did not live according to Proverbs (97) and that He went to the cross without consulting a counsel of elders. While I’m fine with questioning the imperfect nature of all other human vessels, this was neither appropriate or correct. Jesus consulted the elders on the mount of transfiguration, He also spoke plainly of this to the disciples (invited them to pray with Him) and was guided in the teaching of the elders through the regular study of the Old Testament. Abraham did little to consult anyone save the Lord when going to sacrifice Isaac while Job received no good counsel at all. So, there are Biblical examples of those who did not follow Proverbial wisdom, Christ is not one of them. Which brings me to my recommendation of this quick read. If you are a thinker, a questioner, a doubter of “Churchiness”, a square peg in a round hole or a Christ follower who has been let down by leaders… This book is for you. I’ve spent two weeks rolling the dynamics presented by Teigreen over in my mind. It’s an infective book, in the good way. I’ve felt the crushing blow of being disappointed by Godly leaders. I’ve also felt the crushing blow of disappointing the Lord and people I love. It’s refreshing to be reminded of God’s patience with us. His grace for our failures and the strength of His plan to use us for His glory. Tiegreen ends with a conclusion that lists several stories he never covers. A man building a giant boat with no shoreline in sight. A general who pares his army down to 300 soldiers in order to defeat an army ten thousand strong and an Apostle who casts out a demon because a girl is annoying him. I like things with an unusual point of view. I like questioning the status quo and I like it when I’m given something new to consider. This book does all of this and leaves us hanging. Because God’s story of redemption continues on in our messy and imperfect lives and churches. I was reminded that God is strong and His plan prevails even when we don’t understand and occasionally get things wrong. In spite of obvious messes, don’t clean up your heroes and don’t expect continual greatness from any other being than the Lord Himself. If God alone is the hero of every Bible story, we are finally reading the book correctly. Thanks Chris Tiegreen for reminding me not to Fix Abraham. When grace and truth meet, we see God. A copy of this book was sent to me by the publisher in exchange for this review.